This image has been doing the rounds on social media and has got me thinking about a few things. Firstly, is this actually true? Having spent a few hours researching online, the only evidence remotely contrary to this assertion I could find was a 2011 survey in Jamaica that suggested that around 60% of those surveyed thought Jamaica would have been better off had it remained a UK colony. Secondly, how accurate is the 140? Again my research has identified 126, rather than 140, but there are a few grey areas. Whatever, it is well over half the roughly 200 countries on the planet today, that have gained independence since 1945. Thirdly, how many of these have gained independence from the UK? I make it 48 (or about 38% of the total) and with the possible exception of Jamaica, I can find no evidence of any of them remotely regretting their decision. Most are much smaller and less wealthy countries than Scotland. And none of them are known as the Brave either!! There is only one possible conclusion. Scotland will not regret becoming independent. Voting NO will consign generations of Scots to the regret of what might have been, and the rule of fear over hope. This entry was posted in Uncategorized on September 14, 2014 by Bridgend's Green Leftie. You might want to do some more research. Many of the countries listed either collapsed into civil war or economically crumbled quite quickly after gaining their independence with catastrophic results for the population. There are plenty in that list that where independence really didn’t work out. After Algeria went independent, the political system was rapidly Islamised and radical Islam was allowed to spread. The country collapsed economically within 20 years, and within 30 civil war broke out between FIS (Islamic state supporting groups. Angola went independent from Portugal in 1975 and immediately collapsed into civil war, fighting for nearly 27 years and killing millions until reaching a ceasefire in 2002. Life expectancy in Angola has fallen to 39. Armenia and Azeraijan’s secession from the Soviet Union resulted in a crippled economy for both states, and a civil war that lasted for three years and the situation with the breakaway state of Nagorno-Karabakh remains very contentious to this day. Both states are recovering, though the Nagorno-Karabakh region isn’t seeing any benefit. Bahrain is prosperous, though politically unstable and frequent uprisings have led to a number of civilian deaths since independence. Bangladesh’s peaceful independence in 1975 only lasted a decade after the president was assassinated and the government replaced by the military. Bangladesh has since reverted to being a democracy but suffers greatly from high levels of political corruption and an impoverished population. Belarus is one of the least economically and politically free countries in the world and still seems to think it’s behind some sort of iron curtain. It’s generally considered the most repressed European state by a significant margin. Benin gained independence from France in 1960 and underwent 12 years of violence and non-stop regime changes. The Marxist-Leninist government nationalised the banking system in 1972, and the country had bankrupted itself and many people had left the country by 1979. 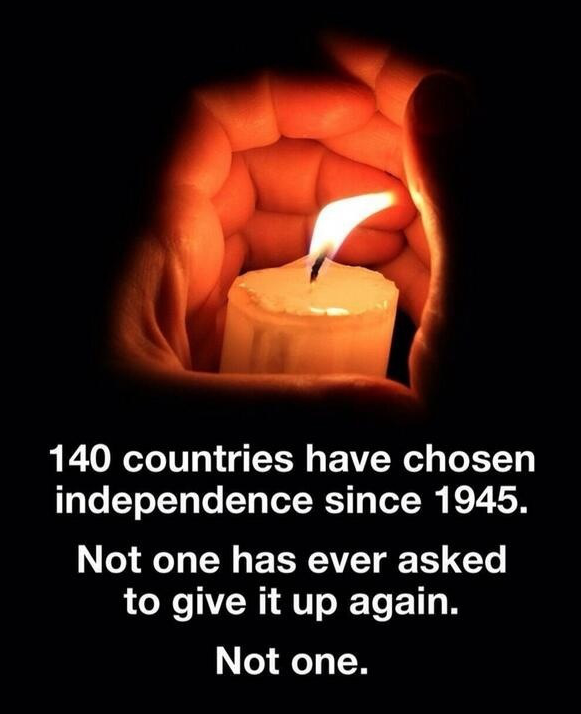 I could go on – but the majority of the countries in this list haven’t exactly benefited from independence. The results for many have actually been quite catastrophic. The issue here is that you are generally comparing apples to pears: almost anything is preferable to being ruled by a colonial country and colonialism is an international crime. For all the problems with the Union, Scotland was not a colony. So you would need to look at countries like the former Czechoslovakia or Yugoslavia and the separations they experienced. Here you have other problems because these countries were Eastern European dictatorships prior to this so the comparisons are different. In short, I don’t think this is an argument but an appeal to emotion. Some perfectly valid points raised above. There are are fair few countries listed that have seen a lot of turmoil since gaining independence. In Africa, in particular, this was in often due to crass artificial borders imposed by colonial powers that bivided natural nations into artificial countries. But references to political corruption and impoverished people are increasingly true of the UK. A driving force for independence in Scotland is a vison of a better future. And for all the turmoil in some other countries, none are offering themselves up to be re-colonised. Self-determination is a ‘for better or worse’ proposition, just like marriage. Does the divorce rate mean people should not get married? Does a potential struggle mean you should not strike out on your own?